Understand your clients better, accomplish objectives faster, and earn trust quicker with our customer handoff template. What is the main business objective of the customer? How do they generate revenue? What challenges or pain points does our product solve for the customer? What benefits or features are they most interested in? How does the customer define success? What are the short-term objectives (and their steps) to help us get there? How do we measure success along the way? What metrics (such as Average MRR, # of Users, and other KPIs) should be discussed? What is the customer's ideal working relationship? What is the best way to contact them? How can we tailor the product or experience to better suit the customer? Is the customer migrating from a competitor? Why? Were there any hesitations or hiccups encountered during the sales process? How can we ensure these don’t happen during and after the customer handoff? List all actionable steps and the team member responsible for each one. Refer to "Defining Success" section for help. What are the next steps for the customer? Is any training required? Is there any other information worth sharing? In relay races, defining moments don't occur at the finish line; they happen when the baton gets passed from one runner to the next. This is no different in business. Customer transitions can be tricky. Make sure you get them right every time with our customer handoff template. This customer handoff template provides a consistent way to transmit relevant knowledge through your business. Tailor it to fit any departmental transfer. So whether you're transitioning a client to customer success or account management, you can always gather the right insights. You can also start all involved parties off on the right foot with context sharing capabilities. 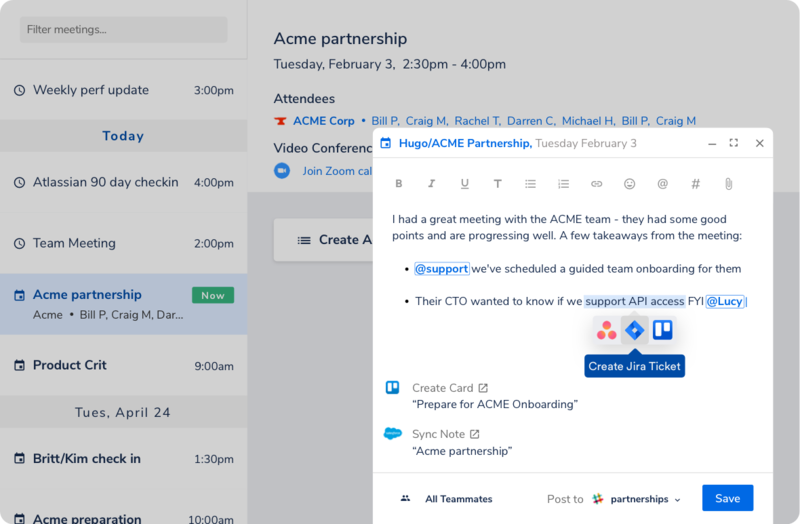 Easily keep your teams aligned on the customer's unique priorities, workstyle, and needs so they can pick up right where you left off and start taking meaningful action immediately. By giving your team a clear understanding of the client, this meeting note template doesn't just let you set expectations; it lets you set a new standard for customer experience. It's a win-win situation for everybody involved. Accomplish objectives better. Establish trust faster. And exceed expectations every time.